Are your social media feeds constantly making you want to jump on the next plane to an exotic destination? Do you catch yourself daydreaming about exciting adventures in faraway lands? If you're suffering from wanderlust, then a world trip might just be the cure. Planning a trip around the world is a daunting task, even if you're a frequent traveler and have incredible organization skills. It often takes months of research to get to the stage where you're ready to board that plane and take to the skies. 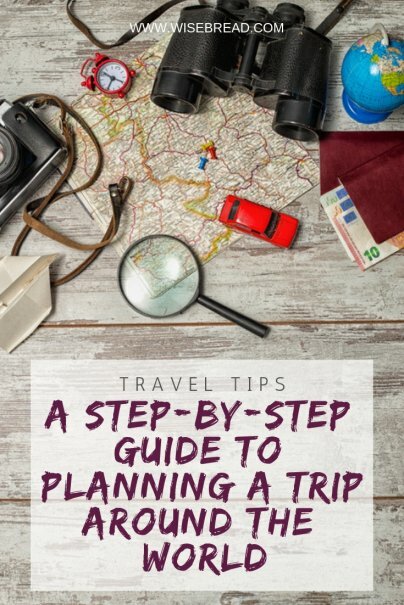 So to help you get ready to for the adventure of a lifetime, here's a step-by-step guide to planning your world trip. Choosing where you want to go is the first step of the planning process, as it provides you with focus and inspiration to follow through on your dream trip. But more importantly, knowing the countries you want to visit will determine everything else. It will help you decide how long you're going to spend in each place, the route you take, and how much to budget. Now that you have a list of potential destinations, it's time to start connecting them into a viable route. Unfortunately, at this stage you're probably going to drop a few spots from your list, as it just won't be feasible to include them all. Remember that the fewer places you visit, the less money you'll need to dedicate to transportation getting to each location, meaning your budget may stretch further. It'll also mean you'll get to spend more time in each place. The best way to plan your route is to pull out a large map and place pins in all of the destinations on your list. You should start to see clusters of destinations that are close to each other and how you might be able to move from one to the next. Once you have a rough idea of the route you'll take, you can start figuring out how big your budget needs to be. Check travel blogs and guidebooks to give you an idea of the costs for each destination you want to visit. You should also look at accommodation sites to see the price of a room during your chosen travel dates. You can then break it down into a daily budget for each location, multiply it by the number of days you expect to spend in each place, and add them together to get your total. It's important to create separate budgets for each country rather than just a blanket daily allowance, as costs can vary wildly from place-to-place. Remember to include transportation, accommodations, food and drinks, as well as things like Visas and border fees. Visas can be both an added expense and complication, but unfortunately as a U.S. traveler, you're going to need them for several countries you visit. Make sure you do your research and apply ahead of time for the ones that require you to do so. Some countries are notoriously difficult to secure visas for and it may only be possible to do so from your home state, so check this prior to buying a ticket. Booking flights, accommodations, and even visits to major attractions ahead of time might not sound appealing, but in some instances it may be essential. For example, if you're planning on walking the Inca Trail to Machu Picchu, there are a limited number of visitors allowed to do so each year. Because of this, you need to book around six months or more ahead to secure everything. Events and festivals will mean that accommodations get booked up quickly as well, so you should have this in place long in advance. There are plenty of things you'll need to get in order at home before you leave, and the earlier you start the less stressful it will be. Make a list of everything you'll need to do and spread the tasks out leading up to your trip. Staying healthy on the road should be your main priority, as lots of countries are affected by diseases and illnesses that we just don't get here in the U.S. Find out what vaccinations you need as soon as you have your route figured out, so you can get them done in plenty of time. There are even some countries that won't let you in without proof that you've had certain vaccinations, most commonly for yellow fever. Lots of people take a chance by heading abroad without travel insurance, but when you're going on a longer trip, it's just not worth the risk. Get a solid plan that will cover you for health costs, travel cancellations, lost luggage, and anything else you need covered. As with any insurance, make sure you double check the fine print to ensure it's suitable and worth the cost.